Ignorance is a huge hindrance to maturity. In as much as the terms south-south, south east and Niger Delta are fraudulent identities from the pit of hell for the purpose of dividing and ruling a people, may I inform you that I have cousins from the so called south-south -Delta state to be precise. Their local government is Ndokwa west. They have the largest and finest gas reserves in the whole of West Africa. Are you ignoring the fact that the entire Delta north - made up of 9 local governments are Igbo speaking? Also in rivers state, you have over 9 Igbo speaking local governments. Are you aware that the finest coal deposits are in Enugu? The only place on earth you have coals deposits side by side with huge gas reserves. Lets put aside natural resources. 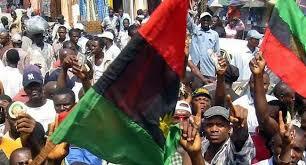 The Igbo speaking Biafrans have flourished in their human capital without oil and gas. Give an average Igbo speaking Biafran an enabling environment and you will marvel at his achievements in a short while. The evidence abounds everywhere in the world. So be rest assured that Igbos has nothing to do with ijaw oil or Ogoni oil or urhobo oil. Unlike the feeding bottle federal system practiced in Nigeria, Biafra is going to be a super federal system where every state owns her resources, infrastructure, electricity and develop at her own pace. Above everything, Biafrans cannot cease to be a people because of oil gas resources. We're of the same history, origin and Progenitors. We have similar DNA. We existed as one people before the evil amalgamation. Lastly, it will be disappointing for you to know that the Ijaws, Anang, Efik, Ibibio, Urhobo, Ogoni, Andoni, etc, are more Biafran than Igbo because they are right on the night of Biafra. Nigerians are so ignorant of Biafra and that is exactly what the zoological republic of Nigeria wants. Nigeria and her creator, the citadel of evil herself –British government, tried all they could to destroy the history of Biafra so as to have people who are quick to say that Biafra is only Igbo.